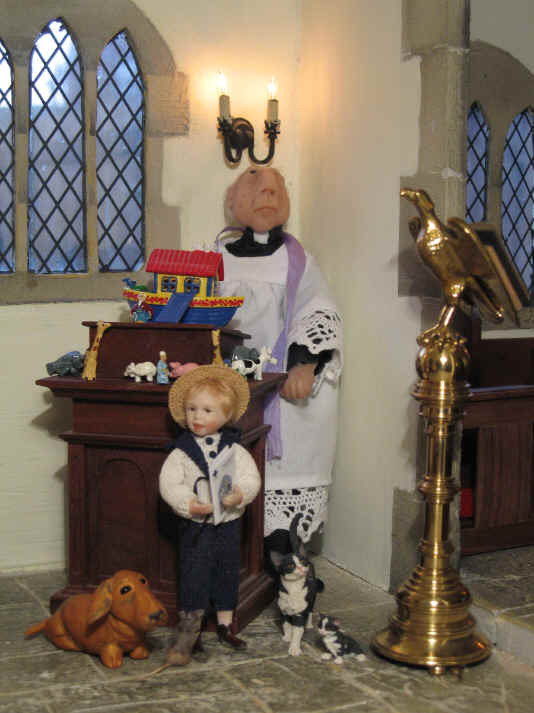 The vicar welcomes you all to the very first pets' service held in St. Hilary's Miniature Church! With the kind permission of the Blue Cross animal charity we have used their own pets'service leaflet, "St Francis of Assisi Day Animal Service" as a basis for our own one. 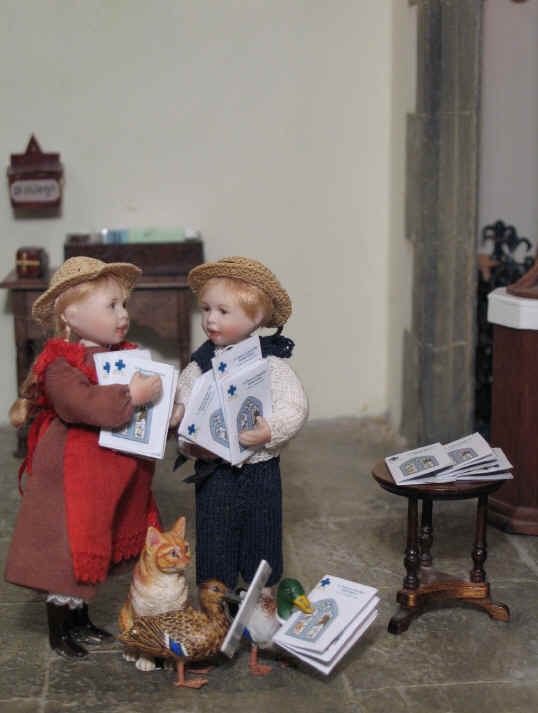 Tom and Adele have been given the VERY responsible job of handing out the Blue Cross pets' service leaflet to all the visitors and animals when they arrive. Look who ELSE is also going to do their bit and give out some leaflets too! Well done Esme and Ernest, the local pair of mallards from the village pond near by! 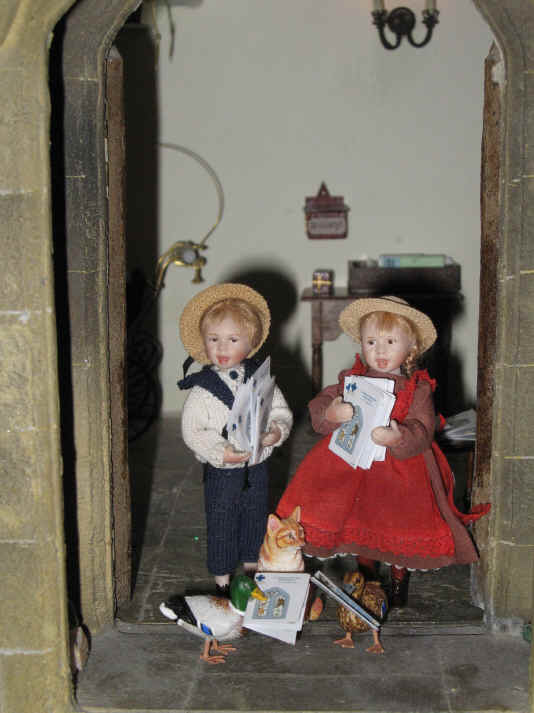 The two children decide to go inside now as it is quite cold standing at the door! As you can see they have printed out a lot of service leaflets as they hope this service is well supported. Magnifi-Cat has decided to keep vigil at the church entrance to make sure that all visitor cats and kittens know that HE is boss in HIS church! Look who has arrived? 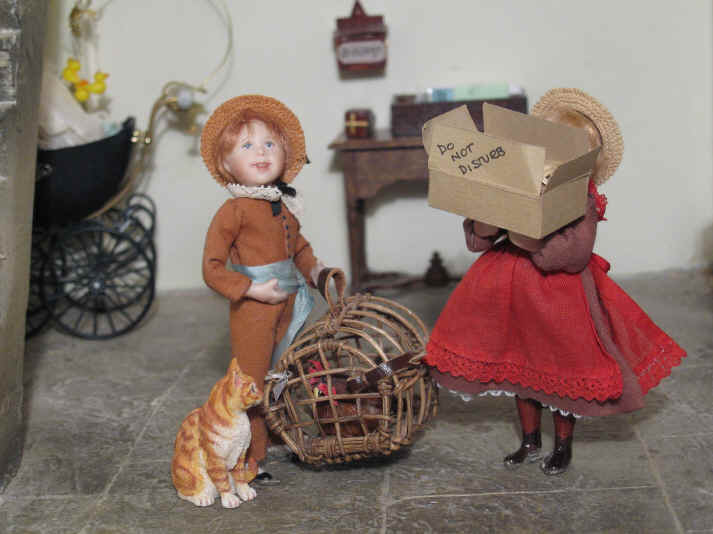 It is none other than Ben, with one of Ambrose's free range chickens in a basket and Adele, with her pet tortoise asleep in its box! Her tortoise is still in hibernation so we hope that nobody's loud singing or talking wake him up during the service! However Adele has written "Do not disturb" on her tortoise's box and hopes everyone reads it and takes note! Magnifi-Cat inspects the two new arrivals VERY carefully........and is very glad that they are NOT cats! Now WHERE has young Priscilla Jane been playing this morning? It looks suspiciously like she has visited the local village pond and fished out some tadpoles! Priscilla Jane tells Ben and Adele that she thought that it would be lovely to have God bless some tadpoles. Little did she realise that, when she fished these tadpoles out of the pond and put them in her jam jar, the two parent frogs would notice and jump out and follow her to make sure that their babies were not going to come to any harm. Alice and her young sister, Megan, have brought their handsome Bassett Hound, Henry, to church to be blessed by the vicar! Doesn't he look a lovely and friendly pet dog?! Alice and Megan are understandably VERY proud of him. Henry is a very obedient and well behaved dog too so they know he will be good and not bark once during the service. It is nearly time for the first hymn which is "Morning has broken"! Phoebe is to play for this pets' service and she is very nervous as you would understand. 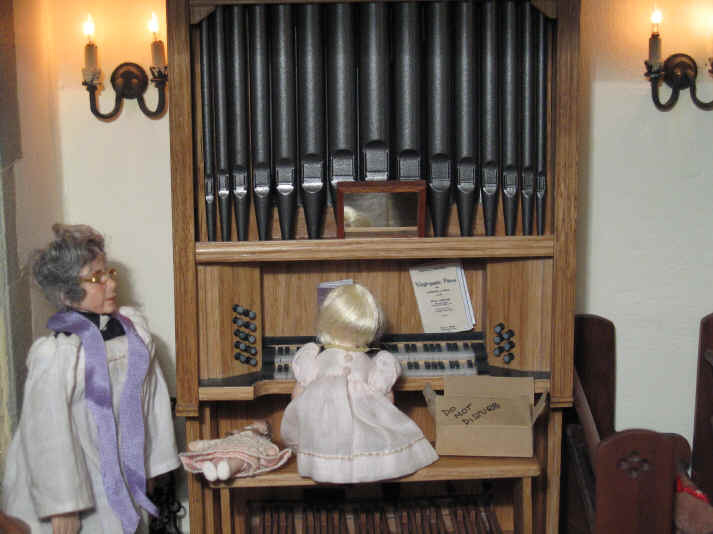 She is taking great care to make sure she plays no wrong notes during this important first hymn. However, Phoebe is even more nervous than usual today because Adele has asked her to take temporary care of her pet tortoise. Let us hope that the organ playing the first hymn does not wake the poor sleeping tortoise up! 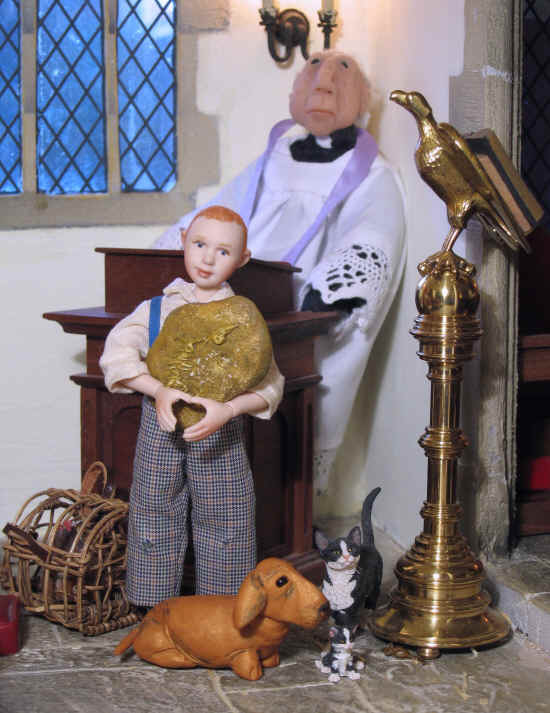 The vicar has asked Ambrose to bring something VERY special up to the pulpit in order to show the children and congregation! Can you guess what it is? It is a fossil that Ambrose and his father dug up a few years ago. You can clearly see an imprint of a prehistoric dinosaur on it! This creature would have lived many many years ago before God created men and women! The vicar told the children that God made and loved the dinosaurs too when he made them all of those many years ago. He thought it was good to remind the children how wonderful God was in the variety of creatures He had made since He created the earth. Alice is reading the second lesson. This second lesson is taken from Genesis Chapter 8 verses 1-19. It is the story of Noah's Ark and the children love this story every time it is read to them. This reading tells of how God let the water recede and Noah was told to send a dove out to see if there was any dry land and, after sending the dove out three times, it does not return. 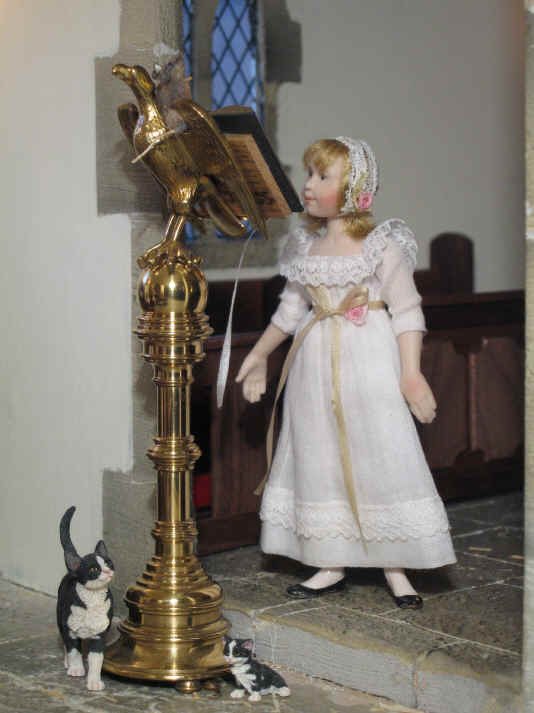 Sue, the mother cat, and her kitten have been brought to church by their owners and they are enjoying playing around the lectern whilst Alice is doing the reading. Can you see someone else in this picture? It is naughty Sepp, Homer's pet rat. She has climbed up the lectern to get a birds' eye view of Alice as she is reading the lectern.....NAUGHTY Sepp! 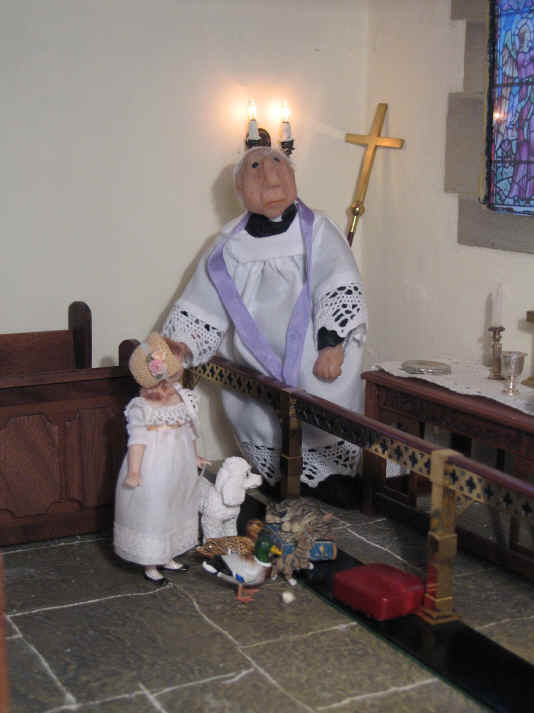 The vicar has surprised the children and has brought along a lovely toy Noah's Ark to show the children during his sermon to them and the animals. He shows them all the different animals that it has.........two elephants..........two giraffes..........two lions.............and more! He explains to the children that God sent the big flood to punish all the people for their naughtiness in not obeying His word. However God decided to save Noah and his family and when the flood receded, promised that He would never again send such a big flood as a punishment. The vicar went on to tell them all about the patron saint for animals and birds, St. Francis of Assisi. He also reminded them that the bells in the bell tower are also dedicated to St. Francis so animals and birds are very precious to God as well as people. Oh dear....has anyone noticed an animal that has fallen over on the pulpit that belongs to the ark? Poor Tom! He had been asked by the vicar to assemble the ark and all the animals....but must have knocked the elephant over and forgotten to put him upright again. The vicar forgave him though for not noticing because he had done a great job otherwise. And as the vicar told him...nobody is perfect. 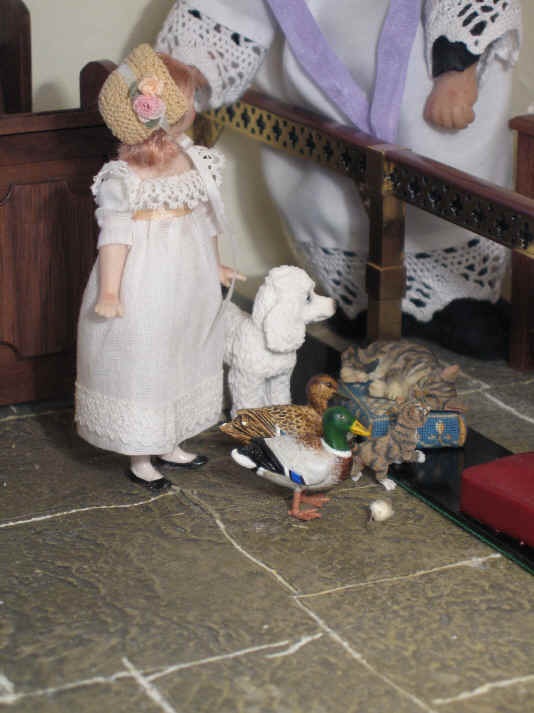 It has come to the end of the service and the animals have begun to come up to the altar rail to be blessed. Before the vicar said the final blessing he said this prayer taken from the Blue Cross service leaflet..
"Help us to reverence all life. Every sparrow that has ever lived and who ever will live is yours. That is how you know when one dies. And whose life you sustain. Just as you do, because we are all yours. Have you noticed someone fast asleep on the kneeler? This poor young mother cat is plainly exhausted after playing with her little kitten! As you can see the kitten is going to try and waken her up so that they can carry on playing! A little white mouse is being very brave and checking out the kitten and its' mother..........we hope that the mother cat doesn't wake up and see the mouse.........Fortunately the kitten is much more interested in playing with his mother to notice the mouse behind him. We strongly encourage everyone to visit the website of The Blue Cross and donate if they have a heart to. We know that all donations will be gratefully received and put to good use in the care and support of needy animals, birds etc. Thank you folks! 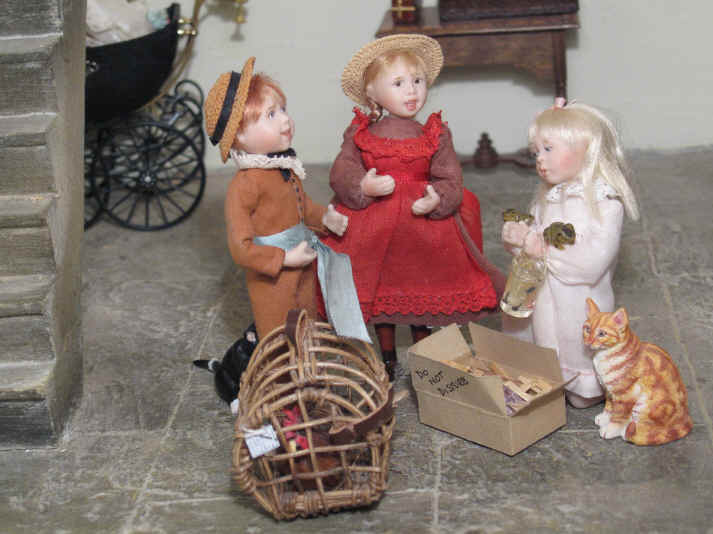 Thanks to sister Catherine for the loan of the bassett hound, chicken in the basket, tortoise in a box,the pair of cats and their kittens and the Noah's Ark! 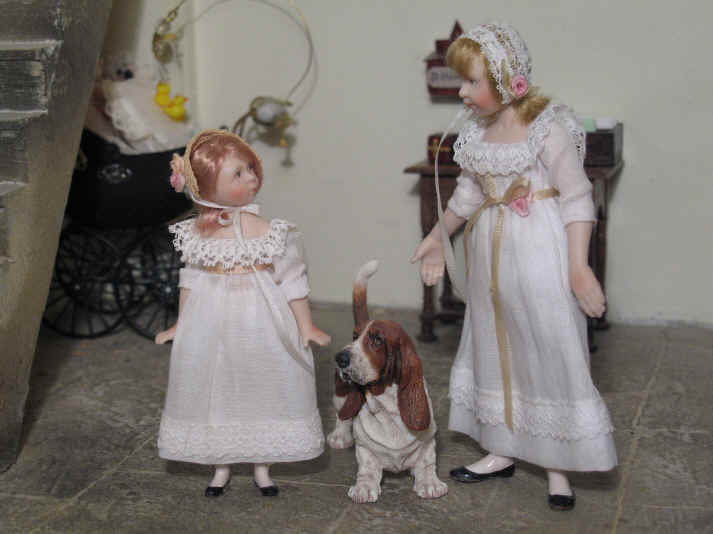 The bassett hound, cats and their kittens are also by Sarah Schiff and the chicken basket is by C and D Crafts. The Noah's Ark is from Warwick Miniatures. Again many thanks to Catherine for this fossil! Catherine made it herself too!